The full film is out on March 31. WorldStarHipHop will share an original Kodak Black documentary Project Baby on March 31, and today you can watch a new teaser trailer. The 30-second clip features shots of what looks to be Kodak Black's hometown of Pompano Beach, Florida, intercut with studio time with Future. 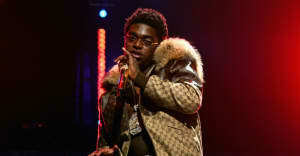 Kodak speaks on his craft in voiceover narration: "I don't rap, I illustrate. Everything I say, it's like you see it visually." Project Baby is out March 31, the same day as Kodak's debut album Painting Pictures.